The Omni Series KWH/Demand Power Meter with Communication capabilities is the most advanced, easy-to-install and versatile power meter available on the market today. The Omni Series Power Meter is a multi-functional device featuring configurable power quality and electrical monitoring features with built-in wireless radio communication interface, wired communication interface using Modbus protocol, LCD display of electrical power, voltage, consumed energy and demand in "A" or "Y" three-phase applications. The meter also features an internal temperature sensor and add-on multi-purpose I/O channels. Applications for Omni Series meters include energy monitoring, tenant billing, power management, smoke detector monitoring, temperature sensor reading, electrical heating/cooling control and operating electrical power load control devices for energy management and cost reduction. The Omni Series KWH/Demand Power Meter with communication capabilities is designed with communication capabilities in mind. 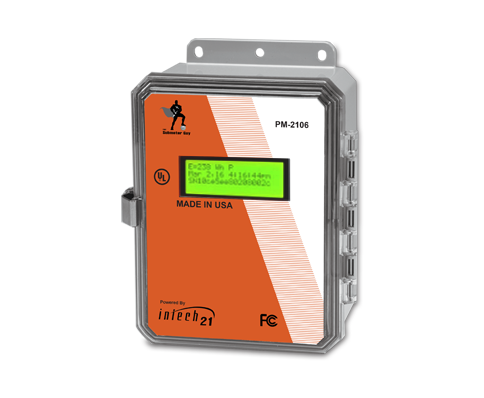 The Omni Series meter is powered by Intech 21 Communication Technology and can interface with the Intech 21 Wireless Control Network. The wireless control network is designed to simplify and reduce installation costs of building monitoring and control solutions. The system can perform a variety of functions including meter reading and energy monitoring, tenant billing, smoke detector monitoring, temperature sensor reading, electrical heating/cooling control and operation of load control devices for energy management and power savings. The system is Web-Based with the purpose of easy user access via the Internet to the building's real-time data as well as to the information in the central database. The Omni Series meter is equipped with an embedded radio communication device which is configured as a wireless network node which allows the Omni meter to interface with the Intech 21 Wireless Control Network. Auto-ranging voltage 110V-480V AC, 60 Hz for three-phase, 4-wire applications. New work style meters include (3) solid-core CTs. Old work style meters include (3) split-core CTs. 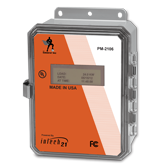 Meter equipped with an embedded radio communication device which is configured as a wireless node allowing the Omni meter to interface with Intech 21 wireless control networks. Meter self-configures to the network upon installation. No hardware programming is required. Meters are interchangable which reduces the possibility of installation errors by personnel. Wireless operation is in the 902-928 MHz frequency band dedicated for non-licensed industrial scientific medical (ISM) applications in the USA. Versions for other frequencies are available. Data Retention: Data flash memory allows optional logging of measured data. Energy usage may be saved in a log for each demand intervfal and may be retrieved via Modbus.